Anyone that grows a Rose of Sharon for a few years will quickly learn how versatile these plants truly are. Not only are they stunning to look at with their profuse blooms all season long, but the Rose of Sharon is incredibly easy to shape into a variety of desired shapes! Most varieties will grow upwards of about 8 feet or so tall, with a spread of around 4 to 6 feet. This growth habit makes them natural candidates for creating blooming hedges! 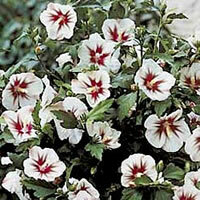 There are a number of ways you could create Rose of Sharon hedges out of a group of these bushes. There are short varieties that only grow about 5 to 6 feet tall, and since that is also the normal height of a fence line, those are great varieties to create a border. Using the shorter varieties also makes trimming a breeze. After all, wouldn't you rather trim a bush that only grows 6 feet tall rather than one that could get away from you up to 10 feet? The first thing you need to do obviously is choose the plants you would like to make the hedge row out of. Now one important point to consider is Rose of Sharon are deciduous bushes, which means they will lose their leaves in the fall. So if you are looking for a privacy hedge, these are probably not the best choice for your landscaping. On the other hand if you are only looking for a seasonal hedge border, for instance around a swimming pool where you would only be using it during the warm summer months, then these would make a great option. Be warned however, bees love these bushes! With that out of the way it's time to choose your plants. You can pretty much order whatever combination of colors you would like, but pay special attention to the size your choices get at full maturity. It would look strange if you were to pair up a smaller variety like the Lil Kim, with a tall variety like the Blue Satin. Try to choose varieties that in the end will grow about the same height. This is not only for consistency across your hedge line, but it also will make your Rose of Sharon hedges easier to manage if you can't stay on top of them as much as you would like to. Pruning your Rose of Sharon bushes is actually quite simple and should be done early in the plant's life in order to achieve the best results. If you allow it to grow unchecked for too long, your plant will establish very thick trunks from which it will branch off. Once these trunks are established it is difficult to train the bush to do anything else without gutting it and severely hampering it. So before you get any of them into the ground, take a moment to decide what shape you are going to go for. There are two traditional styles of shaping Rose of Sharon hedges. One way is to force the bush to grow out of a single main truck, as was mentioned above. This is relatively easy to do as you just choose the biggest and healthiest branch in the center of the bush and prune all others. Then don't allow the bush to grow any offshoots on the bottom 2 feet or so of trunk, and this forces it to grow leaves and branches up high. Using this method you are effectively creating a Rose of Sharon tree. You can line multiple plants up like this side by side to create a row, but obviously with them being open along the bottom, it does not offer much in the way of privacy. The other method is to take hedge trimmers and essentially shape them as a whole early one, before they are able to establish a few main trunks. In this fashion you are shaping them the same way you would any other hedge plant. You need to keep them tended often however because the longer you allow the new branches to get, the thicker and tougher the older, inner branches will form, making I harder and harder to maintain a compact shape. You can square off the bushes or use the trimmer to make them rounded, either way give them a quick prune at least twice a month to maintain the desired shape. After the 2nd or 3rd year of maintaining a disciplined shape, you will find that your Rose of Sharon hedges are much easier to keep as they will have established their growing habit around that shape. The growing conditions for Rose of Sharon hedges believe it or not are actually quite forgiving. Just like their distant rose cousins, the Rose of Sharon requires a lot of direct sunlight to keep giving you all those beautiful blooms throughout the season. 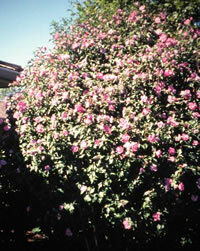 Unlike their high maintenance cousins however, the Rose of Sharon can tolerate much hotter and drier conditions. This is a feature that makes them favorites of gardeners everywhere. It is actually quite easy to work a Rose of Sharon into most landscaping ideas, and it's tough to argue the value all those colorful blooms bring to the garden. One thing to consider when creating hedges out of these bushes is they do not do as well in shady locations and they can become quite susceptible to fungal diseases if grown in too much shade. 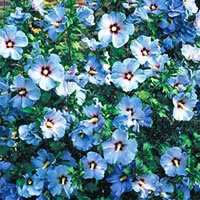 One of the reasons for this is shady areas tend to stay wet longer, and the Rose of Sharon prefers a drier soil. You can help prevent this by making sure the soil you grow them in has very good drainage. If you give them the right growing conditions, and stay on top of their care for the first 2 or 3 seasons, you will find these bushes make exceptional hedge rows and you just can't find any other hedge that will bring this much color and flair to your landscaping.